Take a walk through this custom rambler home in Savage, MN and you will be drawn in by the touch of rustic throughout. With the open layout and sweeping views, this custom home consumes its visitors with its charm. Below are a few highlighted areas that will help you envision the home. KITCHEN – The gourmet kitchen features stained cabinetry with an enameled center island and farm sink. 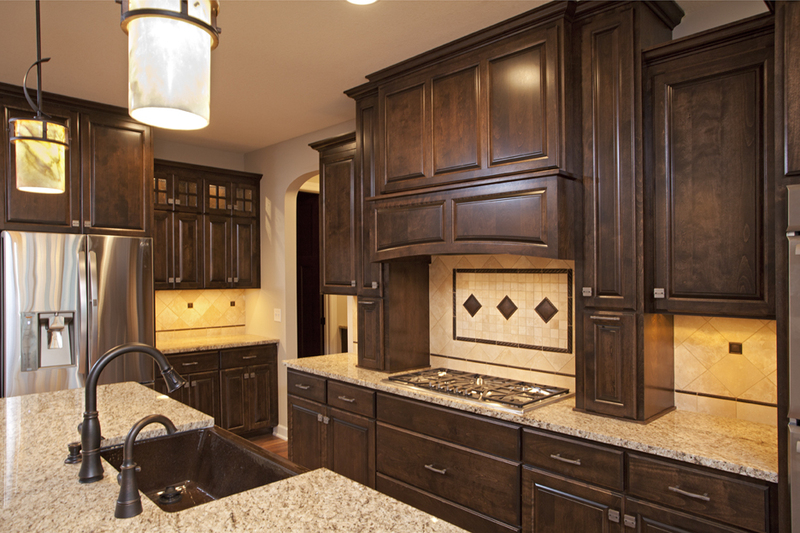 Your eye will immediately be drawn to the travertine backsplash designed in an intricate layout. Equally important is the custom wood oven hood with pullout spice racks, cooktop tile design, and breakfast nook. A cooks dream! TWO-SIDED FIREPLACE – This home brings the outdoors in with a two-sided fireplace in the great room and porch. With a natural stone surround and oversized windows on each side, homeowners can enjoy the views of the outdoors while sitting indoors! LOWER LEVEL ENTERTAINING – If you enjoy entertaining in your home, this lower level is for you! Full wet bar features knotty alder cabinets with skinny linear slate backsplash. Seating side of bar is wrapped in natural stone with lights under granite for ambiance. Oxidized metal fixtures over the pool table add to the rustic element. POWDER ROOM – The homeowner provided a vanity that is a refurbished and repurposed dresser. With a petrified wood vessel sink, rustic chandelier and an artistic mirror with shutter surround, this powder room is truly unique. These are just a few highlights in this amazing home! We are having a Showcase Event tomorrow night (June 24th) in Savage from 5pm-8pm. Feel free to sop out and walk through yourself – everyone is welcome! Contact info@homesbytradition.com to RSVP or ask for more information.